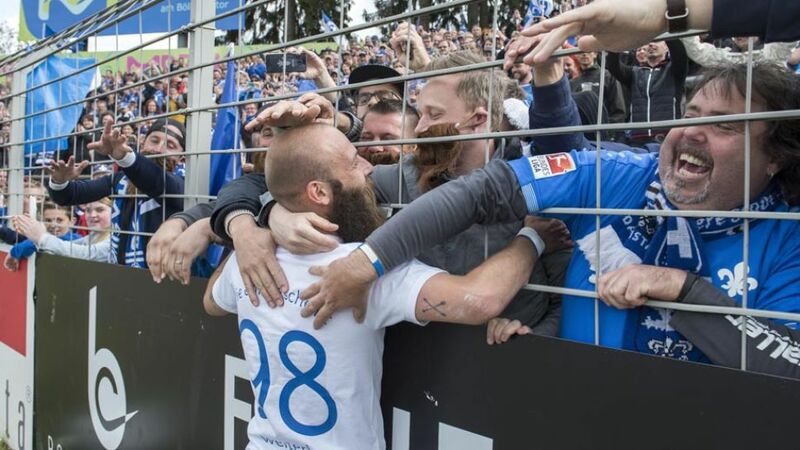 Darmstadt have a second season of Bundesliga football to look forward to after surprising many by avoiding the drop straight back down to Bundesliga 2, exalting the strength of team spirit in a remarkable return to the top flight after 33 years away. Darmstadt are perhaps the surprise team of the season, and even if their coach Dirk Schuster may never admit it, not even he would have thought last summer that his side would have gone into their final game of the season free from relegation worries. They managed that thanks to a compact, united team, without any particular stars but brimming with team spirit. You don't have to live in the Rhine-Main area to realise how much this win for the underdogs meant over their illustrious neighbours, who have for over three decades been the leading force in the district. Darmstadt sealed their place in the top flight with a game to spare, and with a performance which typified the Lilies campaign: faced with their Goliath, pushing for Champions League qualification, the Darmstadt David struck with two accurate stones to upset the odds and silence the critics for good. It may have ended in defeat, but this was the game Darmstadt's fans were looking forward to most, and their team gave them plenty of joy at the Allianz Arena with a half-time lead. Even Bayern coach Pep Guardiola praised Darmstadt for putting his side on the ropes, even if their second-half comeback dashed the visitors' dreams. Sandro Wagner was one of Darmstadt's most experienced campaigners at top-flight level, having previously appeared at the top table with Bayern, Bremen and Hertha, but his 2015/16 campaign exceeded even his own expectations. With 14 goals – more than in any previous season, at any level – the 28-year-old supplied almost half of the Lilies' goals. Aytac Sulu's performance as the most prolific defender in any of Europe's top leagues also deserves a mention.